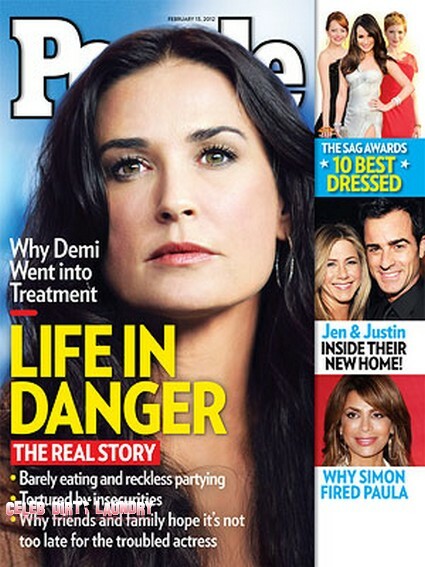 The current issue of People Magazine features the cover story ‘Why Demi Went Into Treatment – Life In Danger.’ The magazine claims that they have the real story behind Demi Moore’s troubles. They claim Demi, 49, has put her life in danger with barely eating and reckless partying all due to her tortured insecurities. They go on to claim that her family and friends are hoping that it is not too late for her. The magazine goes on to claim that Demi who is out of the hospital and back at home, after a seizure, caused by either inhaling nitrous oxide or “exhaustion,” depending on who you believe, is seeking treatment. As Demi approaches her 50th birthday the only thing that made her feel younger was her younger husband Ashton Kutcher who she recently split from. It can’t have helped when Demi split from her husband of 6 years, Ashton, last November, over rumors that he cheated on her. However, some people are speculating that Demi’s substance abuse issues may have also contributed to their breakup, and they point to her shrinking body frame as proof. To find out more about Demi’s breakdown and how her ex-husband Bruce Willis tried to help her, pick up the current issue of People Magazine.